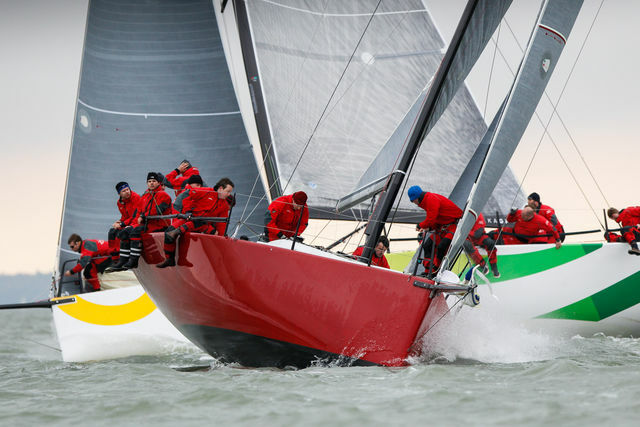 A stiff northerly breeze gave the second day of the RORC Easter Challenge more of a winter feel, rather than a spring one. But an early start and a shifting knot wind that built towards 20 knots were enough for the Race Committee to hold four races, making up for yesterday’s single race. In IRC One, Anthony O’Leary in the turbo charged Ker 40 being sailed this season as Antix, with the permission of the American owner, is currently the runaway leader, having won all but one of the five races held so far. The crew on Antix, two time winner of the Brewin Dolphin Cmmodore’s Cup, now holds the biggest lead across the Easter Challenge’s four classes.